As your employees are completing their reviews and you might be closing them out before officially ending the cycle, you may wonder what each review cycle status means. The review status can be found by clicking into the review > Reviewees > "Status" to the right of their name. None received: None received means that no reviewers have filled out a review on the reviewee - no reviews have been submitted. Incomplete: Incomplete means that there are still reviewers left that haven't written reviews for this employee. The review packet is incomplete without their submission. Completed: Completed means that all reviews for that reviewee have been submitted. Everyone who was being prompted to write a review for that person completed and submitted their reviews. If the admin (or manager should permissions allow) want to close out this reviewee so that their manager is notified and prompted to share the completed review packet with them, they can do so by clicking the three dots to the right of their name > end review cycle for reviewee. In the above image, Rebecca has 6/6 reviews completed on her. Therefor, her status is "Completed." We can "end review cycle for reviewee" and her manager will be prompted to share the review packet with her before we officially end the review cycle by clicking "end review cycle." 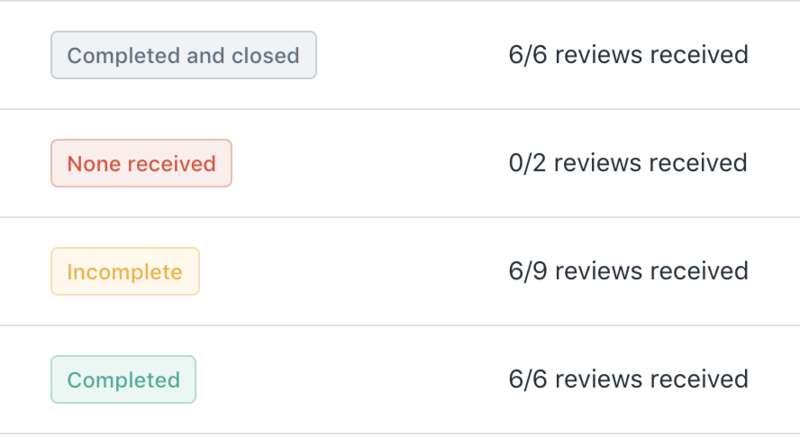 Completed and closed: If you end the review cycle early for a reviewee because their reviews were completed (like Rebecca's above), the status will change to "Completed and closed."